This modern style villa is located in Labinci near Porec. The modern décor and amenities with a touch of traditional architecture will provide you and your family or friends with a comfortable place you can call home while vacationing on the Adriatic. Outside is a private swimming pool with whirpool. Balcony offers a fatastic sea view. 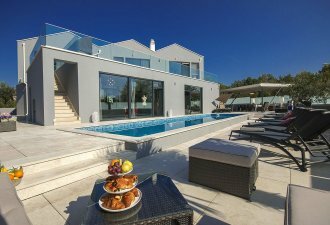 You will also find exclusive garden furniture, sun loungers and a large outdoor dinning table for 8. On ground floor are 2 bedrooms, one of them has private bathroom and nice gallery. There is also another bathroom and a separate toilete for daily use. Large living area with high ceilings offers plenty of light. Nice modern stairs lead to first floor where is an "open space" bedoom with a large sofa bed and access to balcony, another bedroom and bathroom. In basement is traditionally decorated taverna with billiard, table football and selection of Istrian wines.